Since this Tuesday the weather in Melbourne has been rainy, gloomy and depressing. Not just that, it is freezing Down Under at the moment! I can be wearing my thickest, warmest winter coat and still feel cold underneath all that layers. So I thought back to my childhood and remembered a dish that my mum used to make, which consists of chicken, ginger, champignon mushroom cooked in sesame oil and lots of rice wine. Traditionally, this is a dish for women in confinement (a Chinese tradition for women after childbirth), but it is a tasty meal. The ginger and wine combination makes it a hearty winter warmer to be enjoyed by all. This dish and the rich aroma that is currently wafting into my room transports me back to my girlhood, where I would have two or three servings of the juicy chicken and mushroom. In fact, this dish planted my love for all types of mushroom! Yet I never thought a simple dish be something that I cling onto today to keep me warm. 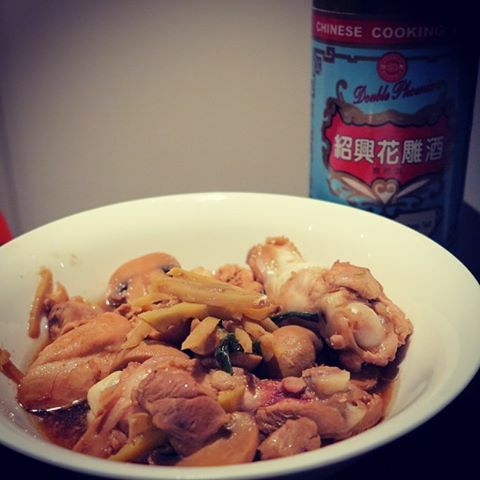 For the recipe for this delicious dish, please click here to The Little Teochew, a Singaporean food blogger, whom I have to thank for this sentimental dish.